Shady Ladies soon after planting. July 2012. 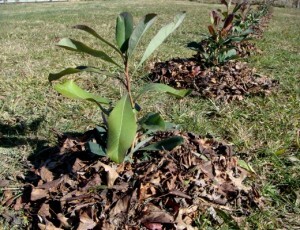 Thus far, my attempts at growing Waratahs have been the least successful of all plantings. I had been warned that they are slow growers, and they are in a windy exposed area, and it has been an unusually dry year; so maybe it’s only to be expected. Six plants have died, in a very obvious, desiccated fashion. 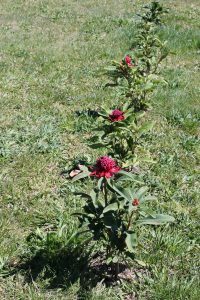 Most of the remaining twelve look healthy, but haven’t grown much since I planted them last July, and there’s been no sign of the beautiful flowers for which Waratahs are famous. Oh well – I’m going to see how well they do next spring. If they improve, then I’ll replace the six demised Waratahs. If they don’t pick up their game, then out they’ll come, and I’ll try something hardier. Shady Lady Waratahs’ 2nd year. Well, here we are in mid-spring, and it seems my dire predictions for the Shady Ladies have proved wrong. A couple that I’d given up for dead, have actually held on (although still looking somewhat desiccated), and the others have actually done quite well. To date, it seems my unreliable watering and the occasional gale force winds have only killed four of the Waratahs, with a further two more-or-less clinging onto life, and the other 12 doing pretty well. The ones further down the hill, and a little less exposed, managed to put out some spectacular flowers, which have only just begun to fade. I’ve bought two more plants (older and more expensive) to replace two of the missing ones, and have decided to do without the other two, which were on the end, so haven’t left a gap. Now, I just have to remember to water them, and hopefully we’ll be rewarded with even more of their stunning red flowers next spring. Waratahs with new growth. 27th October 2014. Waratahs flowering. 8th October 2014. The waratahs have spent the last year failing to grow and generally looking unimpressed with the world, but once again, just as I was considering replacing them with something less finicky, spring arrived and they burst into their glorious bloom. Not all of them bloomed, and some of those that did only managed a single flower, but overall there were more than twice as many flowers as last year. 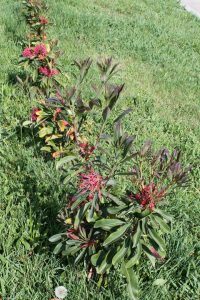 Additionally, while some of the plants were looking a little brown, none of them have died during the past 12 months – a decided improvement over the previous year. I was even more excited as the flowers began to die off, because appearing out of the buds on many of the plants was new growth. 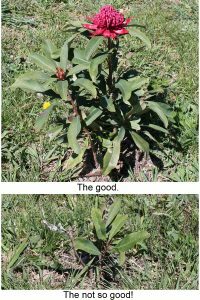 I am now hopeful that the waratahs will increase in size, getting at least a little closer to the promised 3 metres, rather than just sitting around looking sickly and hardly bigger than when I first put them in the ground. Why didn’t they do the same thing last year? Maybe it was the gusting winds or my shoddy watering efforts. Or maybe it’s just something that shady lady waratahs do. I had been told that they take 5 years to become established, but I don’t know if that means they are supposed to spend the first 2 years doing bugger all. Oh well, it doesn’t matter; I’m now just keen to see how they progress over the next year. 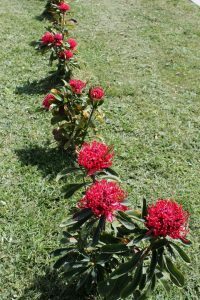 It gives a brief summary of 12 different Telopea cultivars (including the Shady Lady Waratah), a page dedicated to Telopeas in general, and an immense amount of other information about Australian plants.